Huge Savings Item! Free Shipping Included! 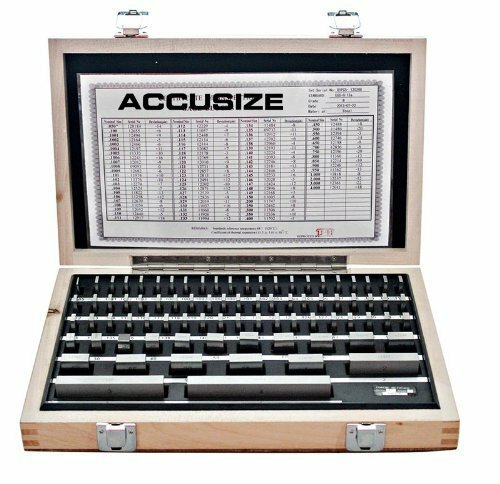 Save 15% on the Accusize - 81 Pcs/Set Steel Gage Block set, Grade B, #P900-S581 by Accusize Industrial Tools at In The National Interest. MPN: P900-S581. Hurry! Limited time offer. Offer valid only while supplies last. If you have any questions about this product by Accusize Industrial Tools, contact us by completing and submitting the form below. If you are looking for a specif part number, please include it with your message. HFS (R) 1 PAIR 123 BLOCKS 1-2-3 ULTRA PRECISION .0002 HARDENED 23 HOLES 0.0002"